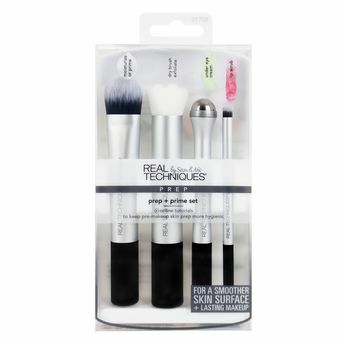 The Real Techniques Prep Prime Set has 4 skin prep tools for your pre-makeup routine. These tools help create a smoother skin surface for better makeup application. The prep brush has densely packed, firm bristles for mess-free application of moisturizers, serums, primers, or masks. The dry facial brush is a textured brush, which gently exfoliates for healthy-looking skin. The under eye reviver is a stationary aluminium ball for cooling under eye massage. The lip exfoliating brush is used in circular motions with your favourite lip balm or lip scrub to gently exfoliate and smooth your lips.